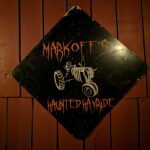 Markoffs Haunted Forest is a Haunted Attraction located in Dickerson, MD. 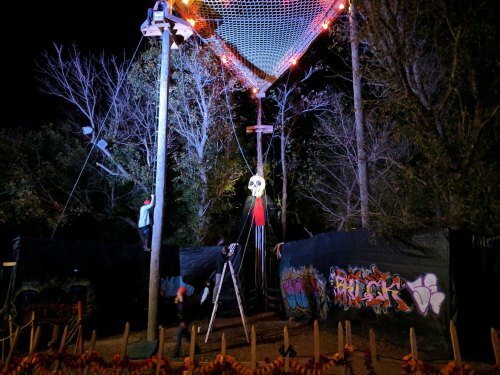 Team Hallowoosh reviewed this attraction on October 28, 2017. 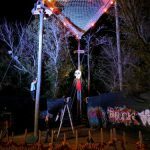 We can’t decide where to begin with this incredible haunted attraction that is Markoff’s Haunted Forest. 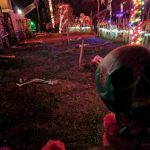 This place is a true hidden gem of the haunt industry and I felt it the minute I discovered them. Truth be told, it was only a few weeks after Halloween of 2016 when I was contemplating where in the country my 2017 journeys would take me. As much as I would love to get out of the North East one of these years, I felt that it just wouldn’t be in my budget to go further than anywhere I could travel to in a day. Without really looking, a photo popped up in my news feed of a bunch of jack-o-lanterns and hay bales glowing under a perfect full moon with all the dead trees carving into the night sky. Already reminiscing the magic that is Halloween, I had to stop and find where the photo was taken in hopes there would be many more. I thought it probably was just a great pumpkin display or something from a haunt I have seen many times before. 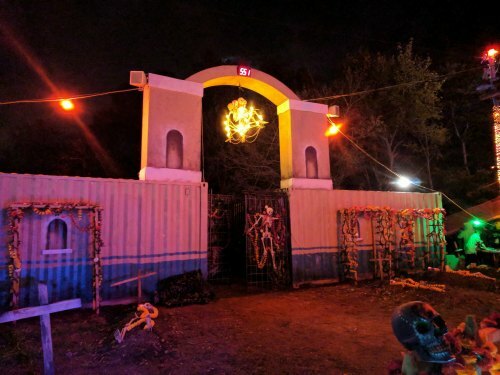 To my surprise, I started scrolling through photos of epic scare actors and amazing sets and all I could think about was how another haunt season has gone by and this NEW attraction seemed to slip by me. I look and tons and tons of photos from all over the country and none of these ones were ringing any bells so it must have been new. Then I start seeing photos of people working on the haunt during the summer with heavy equipment. 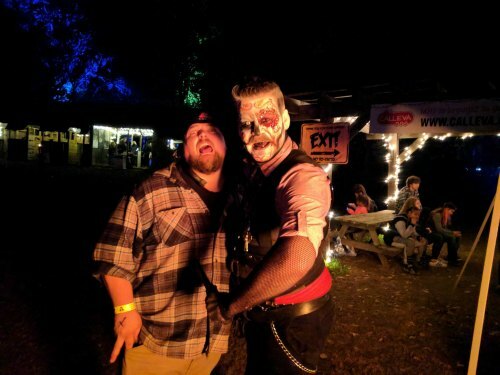 Then I see photos of the haunt getting involved with the communities and they are all posted throughout the year unlike some places. This attraction, just in photos so far, had proven to have all the characteristics and values of what I think make a haunt amazing! I still kick myself in the head trying to figure out why I haven’t heard of this place up until then. 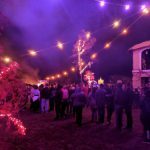 At that point I knew where my ultimate destination would be for 2017, at Calleva Farm presents Markoff’s Haunted Forest! It’s been twenty five years since Markoff first opened it’s doors for business. Technically those doors where on a bus and I didn’t get too much information about their beginning years, but even on the night that we attended this year we found people talking about how much fun it was back in those days. 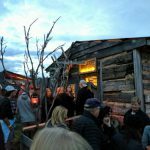 2017 brings Markoff’s into its twenty sixth season and all we could hear about from other guests around us is how it keeps getting better and better every year. 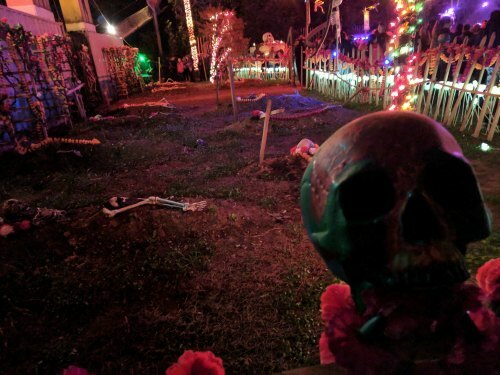 There are plenty of haunted attractions that are solely made as a fundraiser for charity or whatever the venue actually is in the off season. 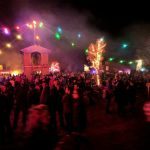 In my experience these fundraiser attractions show a lot of passion and try very hard to make their show something to remember year after year. 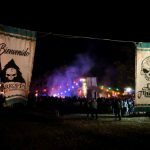 It is a rare find when we come across some of these fundraising attractions that look and act like their haunts are the main business. 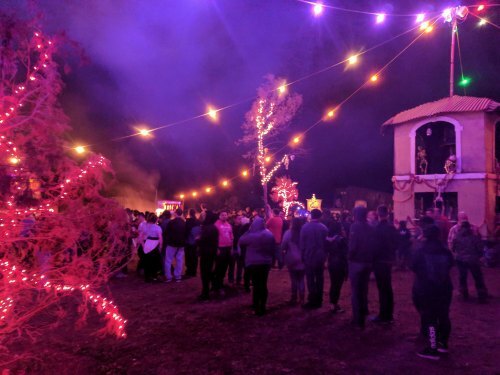 It still blows me away how much time, energy, passion and love goes into making Markoff’s Haunted Forest all in an effort to raise funds for what they really do. Calleva is actually a Summer Camp and Outdoor Educational Program covering everything from kayaking to rock climbing to weeding the gardens on an actual farm. The goal is to give children of all ages the opportunity to learn how important and how fun it is to be outdoors weather it’s paddle boarding through the rivers or tending to livestock on a farm. Particularly children and teens in the Washington D.C. area that do not get many chances to see the countryside. What’s even more heartwarming is the fact that Markoff’s Haunted attractions was made to get funds to START the Calleva programs. It’s nice to know that some people put so much faith into what a haunted attraction can support. Now twenty four years later, after the first program started, Calleva is one of the biggest and most successful outdoor educational programs in the Maryland and Virginia area! 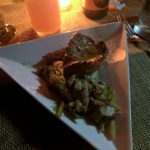 As if things couldn’t sound any better; we were amazingly fortunate to find out about their farm to table dinner they were having. We were forced to move our date of arrival back one day due to a massive rainstorm that would encompass the whole North East for a few days. We checked in with one of the main managers, David “Brokeback” Harding to see if it was still a good night to go through Markoff’s. 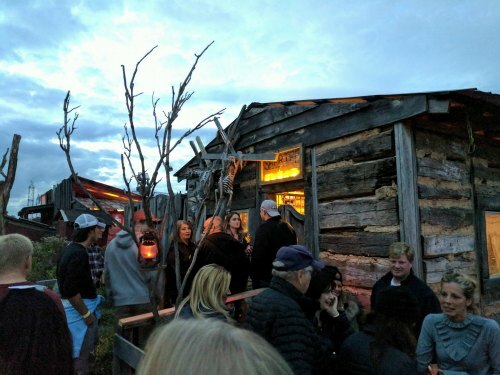 Turns out it was a much better night to see the show as they were offering what they called the “Deadly Diner,” which was a great way to start off the evening with a short tour through their “The Town” old western style attraction with little hors d’oeuvres along the way. 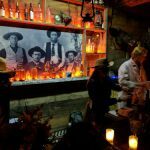 This lead into their old western saloon where they served a few local craft beers and sodas along with a few specialty themed drinks. 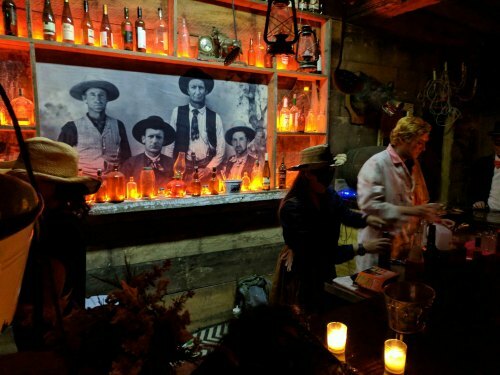 Tables were set up with great fall harvest centerpieces and candle light throughout the whole saloon. We were served excellently prepared breads with soup. 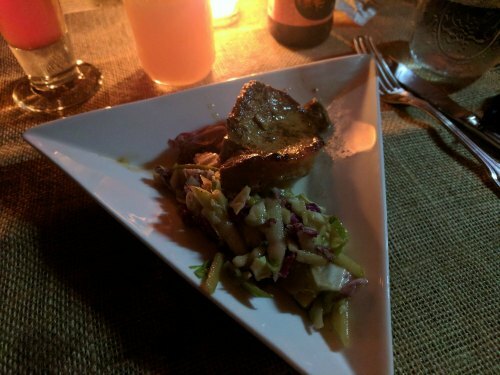 Main course meal of a bean stuffed pepper and braised pork tenderloin with apple slaw. It was absolutely delicious and a huge surprise to us since we didn’t even know about it up until a few hours before we arrived. Then they told us even more great news that practically all of the ingredients used in the food they were serving came directly from the farm we were on! The night just kept getting better and better and we would like to forever thank Mr. Brokeback and the Markoff family and crew for giving us a night we will never forget! 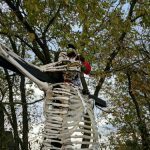 The actors at Markoff’s Haunted Forest are a loyal and dedicated group. The management tells me that a lot of this volunteer group is actually kids from the outdoor programs that fell in love with the farm. They had all the classics for haunted characters; rednecks, zombies, demons, vampires, ghouls, clowns, etc. I particularly enjoyed some of the more unique characters like the vikings and the dark fairy tale crew but the great actors were found in The Town. When we were treated to the “Deadly Dinner” we walked through a portion of the town. The actors that they had in the town at the time were all very interactive and loved to dive deep into their characters. The sheriff gave us a nice little story about how the town started as a couple’s search for gold. Once they struck a gold mine they built a town around it. Something about how mercury got into the water and made a lot of people sick and mad and the rest is haunted history. A butcher kept trying to tell me how many sausages he could make out of me. He was actually infatuated with the thought of cutting me up as I pushed a bunch of hanging sausage links out of my way trying to get away from him. We even got a real treat as we waited to go into the saloon. One of the actors actually played a few good tunes on a banjo. Thank you Markoff’s I can now say I’ve seen FOUR actors in 2017 playing an instrument. Even the ride from the parking lot to the town had actors on it that were giving us a great story of the town. I think I’m going to have to give personal kudos to the head banging girl at the end of both trails. Her job is pretty much to head bang to loud heavy metal music all night long will smashing barrels with a pipe. I think I can do that for about thirty minutes and then I’ll need an Advil, a glass of water, and a pillow. This girl kept it metal all night long! All of the actors and actresses were great. They were never in a spot that didn’t fit or was out of place at all. They all did their best to scare as many people as possible and as far as we could see, they were getting plenty of scares all night long. The fact that they come here as volunteers to help raise funds for a great program and the fact that they come here to be part of a family shows and makes them one of the best. Everyone had different looks to them regardless of what set they were assigned to. All the costumes looked like they were genuinely picked out by their actors. No one was wearing the same thing or painted up the same way. I loved how the actors in The Town would be in all different kinds of old western attire from some dirty overalls to a full-out trench coat. It made the attraction feel much more authentic. Everyone had some sort of gash or chunk of their face missing but not too much blood. I suppose it goes with the story of the town’s drinking water. 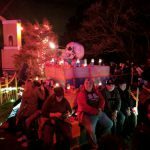 The theme of the midway this year is the Mexican Day of the Dead. There were plenty of actors roaming the crowds with very elaborate sugar skull-style designs on their faces. These were not easy base layers with a few swipes of an air brush. These were small paint brush tip designs on everyone’s faces. All of them had a completely different design. Some of them even had gems or rhinestones in place of all the little flowers you see painted on those faces. Inside the trails I saw nothing different. Everyone was wearing very individually inspired costumes that made the entire attraction feel much more special and real. Not once did I see anyone in any kind of plain clothing. My blood boils when I come across an actor wearing a name brand shirt with it’s logo plastered all over it and to my surprise I didn’t see anything like that at Markoff’s. Markoff’s is located mainly along the west side tree line of Calleva Farms, leaving much of the actual farm land alone as they should. The two trails in the woods are side by side for much of the walk through. The terrain is a little steep at points and it is almost a gully where they are located. There are parts where you would be wise to take a look down and know your footing. For the most part though, the trails are easy going and smooth, there were just a few areas that got a big old fat guy like me huffin and puffin. What are you suppose to expect from a place that is all about getting people outside and going on adventures? Markoff’s does have a midway but in their neck of the woods they call it “The Circle.” Here they have a variety of carnival games, a scary maze, zip lines, a ropes course, fire dancers, music, face painting, 2 theme park-sized concession booths serving all kinds of great food that is ALSO made from ingredients right there on the farm, and 4 Huge bon fire pits! The games and maze work like a regular carnival where you purchase 10 tickets (or tokens) for $25. 2 tickets will give you a shot at some of the games for prizes and all the other activities will cost a few extra tickets. Parking is free and there are plenty of attendants to help you. Driving to the actual Calleva Farms seems a little scary for someone like me who doesn’t drive on back roads all too often. Off of the main road that leads to the historical White’s Ferry the field parking is almost a mile drive up. Once you park there is really no mistaking where to go. They have a little tiny tree line that separates the parking lot and the circle. We could clearly see where the big ticket booth window was and it was obvious we had to go through there before heading right into the circle. Plenty of staff were all over the place helping with any and all questions. I’ve now been to over one hundred and thirty different haunts in my eight years of haunted attraction tours. 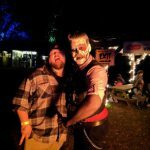 Throughout the years my total number of visits to haunted attractions is over two hundred. 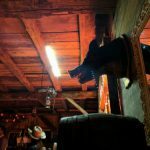 I can very comfortably say that I have never been to any attraction that is even close to matching the atmosphere at Markoff’s. 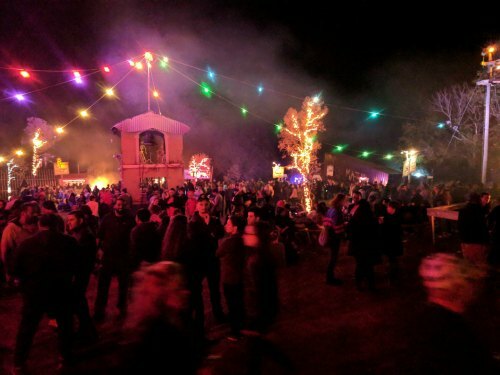 This place is like the ultimate Halloween party of the decade! There is a reason they call their midway “The Circle.” We were surrounded by games, music, laughter and screams. People were zip lining over us and enjoying the amazing food and huge fires. The cherry on top is the string lights that cover the main area. They all start at the top of this awesome Mexican church bell tower right in the center of the circle and they branch out like a giant multi-color spiderweb. They have skeletons everywhere! Did I say everywhere? I mean EVERYWHERE! 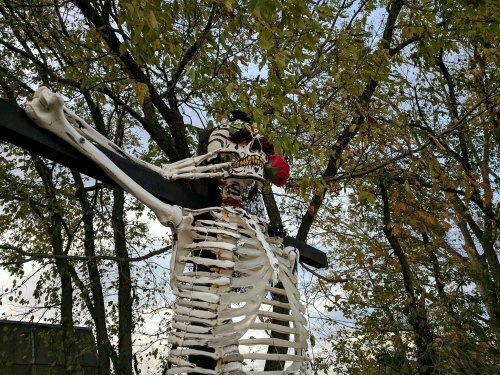 They are climbing the tower, hanging on signs, hanging in trees, taking a nap, chilling with the guests, it is actually impossible not to see a skeleton. That’s without mentioning that half the guests there are in Dia de los Muertos face paint, apparently it was free and there was a line about one hundred feet long of people waiting to get painted up. The circle is the by far the coolest midway I have ever seen. The very beginning of the trail is very dimly lit and actually quiet. The music and noise coming from the circle is softened by the tree line we walked into when entering the trail. There wasn’t much sound around us at all other than the people around us who were a little scared of the sudden change in atmosphere. The further we went into the trail the lights became more and more present. I really respected the use of different colors in these trails. There wasn’t many spots where only one color of light was used unless it was a purposefully dark area. As far as animatronics go, we can’t recall many. Honestly, I feel like most animatronics would ruin the feel of this attraction. 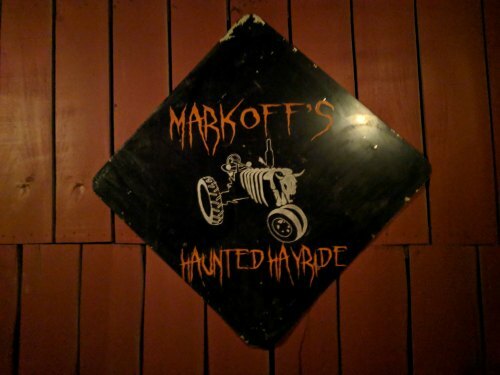 Markoff’s is one of these places where the real fright comes from the spirit of the cast, the sets and the woods. 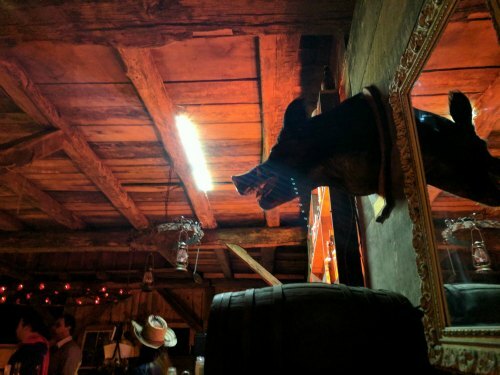 Unless an animatronic could compliment that spirit well enough, this haunt doesn’t require them. The few that we remember were all about the woods, like a dead deer on the ground or a tree falling down. 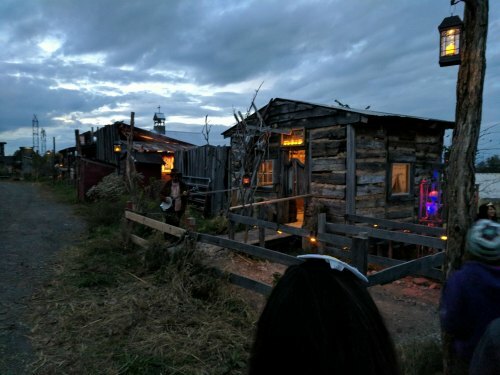 The most impressive aspect of the haunt is the customized, detailed and unique sets. The Viking village is something every Markoff guest will remember forever. It’s a design I have never seen before. We stroll back and forth down a hillside through old tents and campfires with wooden shields and arrows stuck to the stockade fence around us. When we reached the bottom of the hill we saw something I don’t think I’ll ever see anywhere else. A giant Viking ship in the middle of a hundred foot long pond complete with huge sails and a red glowing-eyed, blue fog breathing, wood carved, dragon figurehead! A long dock took us right onto the ship where a few skeletons were rowing. I had to keep walking but I wasn’t looking where I was going at all. My head was just pointing in the opposite direction of where my body was going. I had to take it all in because I honestly felt like that was something I’ll never see anywhere else. 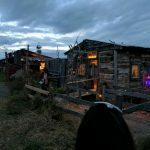 There is no doubt about it that the effects of the entire attraction came in the form of the passionate detail the crew put into the sets. Every building we walked into felt like an artist stood in them for a long time constantly saying “Not good enough” and continued to add more. Although Markoff’s is almost an eight hour drive away from me on a good day, I’m willing to make the trip again to see these beautiful works of art. Starting with The Circle on this topic because every year they change the theme of this section of the haunt and only this section. 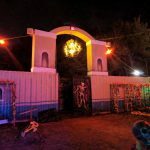 This year Markoff’s did an incredible job bringing the theme and spirit of Dia de los Muertos, Day of the Dead, to their attraction. The marigold flower streamers and necklaces were hung everywhere. There were a few altars with candles and skulls and offerings on them. The only thing that would have made it feel more like a Day of the Dead celebration was some mariachi music, but that would have been fun for like a couple minutes. The Town is an old western village. We started at a short corn maze with a nice little moonshine operation right in the middle of it. Eventually we come up to the Town and got a little glimpse of the epic set they built. We don’t spend too much time looking at the main drag with all the storefronts because the haunt is actually in and through all of the little buildings. But there was no mistaking what kind of place we were in. The only thing we might not have been sure of is what century it was because this town looked very real. We went through a Sheriff’s Office to a General Store (which needed to be pronounced “Gen-rahl” or they got mad) to a small church and a gold mine and even a brothel that I did NOT want to leave! The two trails are named “The Woods” and “The Hollow.” Although there doesn’t seem to be a central theme to either one of them, they are technically in the woods and or in a hollow. Even though the scenes change within both trails, the scenes lasted much longer than most rapid changing attractions I have been through. It must have taken us at least five minutes to walk through the Viking village. The trails actually crossed paths twice before the end. Once was at an insane looking gothic church where the first trail goes into the front door and the other trail goes into the basement. They will meet each other again at a life-sized doll house with crazy dolls in dresses chasing everyone all over the place with chainsaws. Let me rephrase that: guys as dolls in dresses chasing everyone with chainsaws, that’s what’s up. When we walked through the entrance into the woods both times it was the same. The trails start dark and quiet so we could start the intensity at 0, although, the anticipation was quite unnerving too. The deeper we journeyed into both trails the creepier and crazier and meaner it became. We are talking 0 to 11. Dark and dimly lit by little tiny candles and no sound at all to chainsaws and heavy metal music in a junkyard. But to us the frights came in the form of great craftsmanship. That overwhelming feeling that this unknown thing we are about to walk into is much more powerful than anything I’ve faced before. Or these areas are more important and inescapable. The Viking ship made me feel like I was heading into something dangerous but adventurous at the same time. Shortly after we walked through the bone rib cage of a colossal dragon surrounded by the bones of many more. All we could think about was something bad happened here. The cast did a great job at providing some excellent scares and we wanted to stick around some of those scenes to watch them get people again and again. Sometimes when a place looks as good as Markoff’s Haunted Forest, I can’t help but stare at the amazing sets for awhile, which in turn, keeps me distracted. The ticketing process is a little confusing compared to most attractions we have been to. You can purchase tickets at the ticket booth but there is only a limited number per night. Most ticket sales are made online. You can purchase a ticket for one of the two trails. Which trail you would like to go through is up to you. If you wish to buy a ticket for the second trail you can only purchase a ticket for it at the ticket booth, not online. Tickets for The Town are also a separate price and should be purchased online. Instead of a first come, first serve basis, your ticket will have a number printed on it. When your number is displayed above the entrance to the trails, it will be in a big red LED sign bar, like a mini scoreboard. This is like a timed ticket only it gets rid of the lulls that are in between timed groups. The people going through at 8 pm might go through faster than expected, therefore there is no great reason to make the people waiting for 8:15 pm to wait any longer. Fast Passes are available ONLY if you dine at one of five restaurants in the neighboring town of Poolesville, Maryland. After ordering an entree you can ask for a fast pass and a manager will sell you a VIP paper wristband for an additional $5. The concept is to drive a little bit of business into the local economy, which to me is actually a really great thing. For one thing they are helping the community by doing so. Plus an extra $5 for a speed pass is practically unheard of. You do have to purchase a meal first but you could look at it like an extra $20 will get you a speed pass AND a great meal. Plus you have your option of what kind of meal from a variety of different restaurants! Bassett’s Fine Food and Spirits has some great American pub fare food. Cugini’s has some of the best Italian pizza around. The House of Poolesville “AHOP” has some great Asian Fusion. The Mexican Grill has all your south of the border favorites. And The Watershed is a great place that only serves local farm raised ingredients from scratch. Pretty hard to argue with the selection. This all might seem like an overwhelming system just to experience this attraction. Judging from how many people we saw go through that night we couldn’t believe how well it worked. Everyone was entertained and happy, we didn’t hear one complaint about waiting or why they had to pay extra for more attractions. One trail ticket bought online is $30. Second trail ticket bought on-site is an additional $30. 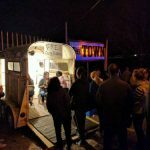 The Town tickets online are $25. 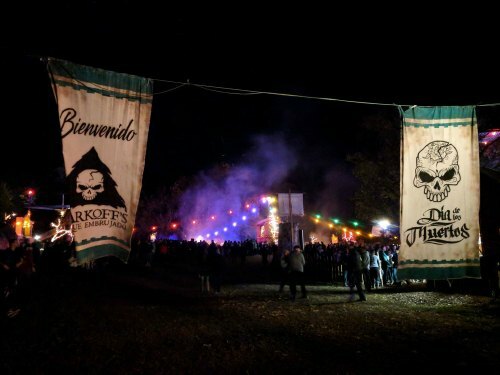 Total cost to see all of Markoff’s Haunted Forest is $85. The time it took us to go through all three attractions came out to 56 minutes. This gives Markoff’s a minutes per dollar score of .66. This is one of the lowest MPD scores I have ever given and therefore one of the most expensive attractions I have come across. But the reality is that you can choose what you want to do. 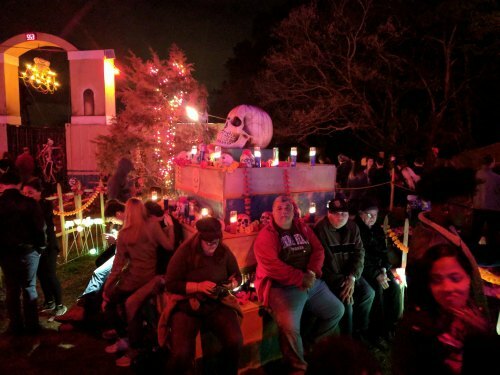 Yes, most people would love to do every attraction that any place has to offer and most haunts in the country operate as such. Markoff’s is on a level where I can be OK with how they offer their attractions and at their marked prices. Because each trail is like an entire haunt on their own and done to such mesmerizing detail, it’s more than just a haunted attraction. Plus it is very hard to find a place with such attention to detail or even a place that offers the kind of party as The Circle! The big thing to think about is where that money goes. It helps keep a farm alive, it helps inner city kids learn the value of the great outdoors, it helps a 501(c)3 non-profit organization stand strong so it can help local independent businesses. 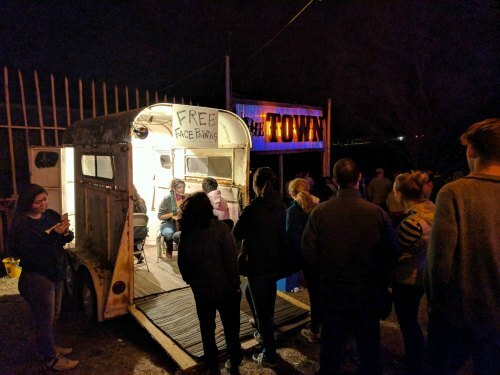 For a little bit more money than you might be use to spending at most other haunts, you will be getting a show that is not easily found and helping the community in so many different ways that you should be proud of yourself for going. 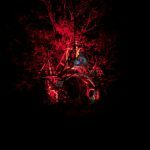 Markoff’s Haunted Forest is absolutely one of the best attractions I have ever seen and I know that a future trip is in order indefinitely! 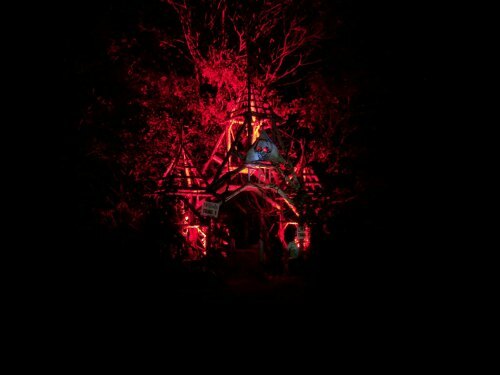 This forest is unlike any other scary attraction. It is the most terrifying Halloween event that I …show more willingly go to year after year. You will not be disappointed. There are always scary characters walking around even when you’re not in the forest. There are huge bonfires to keep warm and side games you can play while you wait until your number is called to venture into the woods. If you live in Virginia keep in mind that they Ferry to cross from MD to VA closes at 11pm!